Like most athletes, Bria Young didn’t do much to deserve her nickname “Swish” after joining the Harlem Globetrotters’ 2017 roster. “I actually had zero say in choosing my nickname,” she tells Suburban Life/Philadelphia Life. “One of the Globetrotters said it comes from my jump shot because when I shoot the ball, it makes a swish sound,” she adds with a laugh. The now 24-year-old is well known for that jump shot of hers, along with adopting—former Philadelphia 76ers star—Allen Iverson’s infamous crossover. 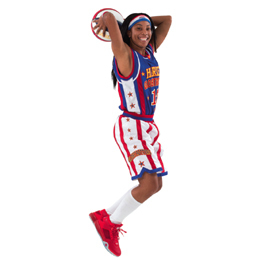 In addition to bringing these moves to the Globetrotters’ game, Young brings another layer to the team: she’s the 14th female player in its long history dating back to 1926. It’s a title she guards carefully, especially seeing how much of an impact her inclusion to the team has had on her fans—especially with the young ones. In fact, those fans are the ones Young focuses on the most. Prior to making her Wells Fargo Center debut with the Globetrotters last month, Young spent some time with over 100 students at her former Philadelphia elementary school, Blair Christian Academy, as part of the Globetrotters’ “ABCs of Bullying Prevention” program, teaching them how to identify and put a stop to bullying, while also sharing her story about growing up to become who she is today. In between games, the rookie took some time to talk about returning home, reaching out to her community and most importantly, why everything she does, is worth it. What was it like being back at your old school and talking about bullying prevention? I was kind of nervous and overwhelmed, but once I got there I spoke from the heart and I just had a connection with those kids because they were once in my shoes and I actually saw myself out there in the crowd just listening. ... It was the best feeling in the world. My favorite moment so far [of] being a Globetrotter is going back to that school and giving back. They made me who I am today, so I owe them a lot. Did you have any personal advice to share with the students about bullying? I think most people, at some point, have some experience with bullying. Growing up, I always was a tomboy, didn’t like girly things and I didn’t like dressing like a girl. So, of course, a lot of kids teased me and called me a boy, but I think that if we just stay strong and try not to let what people say about us affect us, we’ll be OK.
You’re the 14th female of the Globetrotters, how do you wrap your head around that? It’s truly amazing. Now, for young girls, there is someone to look up to. ... When they go to a Globetrotters’ game, usually it’s all males, but now, there are little girls at the games that say, ‘Hey, I want to be like Swish, or I want to be like any other female Globetrotter that we have on the team,’ and it’s not just the girls—it’s also little boys. I’m surprised at how many little boys come up to me after the game that say, “You’re my favorite player.” It’s amazing they can have a female role model that plays basketball. Was it always your dream to become part of the Globetrotters? Growing up I always wanted to become a professional basketball player, but at the same time I always wanted to give back to my community. Once this opportunity came up last summer, I figured it was the perfect dream job for me because, not only do I get to play basketball and get paid for it, I also get to give back to my community at the same time because the Globetrotters are big on community service and outreach. How did it feel to be back in Philadelphia playing at the Wells Fargo Center? It was an amazing feeling. Initially, I didn’t think I would be playing in the Philadelphia area … but like a month [before], I was notified that I would be and it was just a dream. ... I just knew that all my high school and college teammates, the whole city of Philadelphia would come and support me and my family. Stepping on the floor at the Wells Fargo Center … and being introduced and having the crowd give a standing ovation was just … breathtaking. I would [have] never imagined it. What’s the best part about being a part of the team? [It’s] much more than playing basketball. The smiles and the laughter I see at every one of our games and being able to be a role model to a ton of young girls and boys. It’s just the excitement and the comments I get after the game about how the Globetrotters made a family happier, even if it’s just for two hours. ... The memories we create last a lifetime and it’s just fun for everyone—in addition to being able to give back to my community. [My] week in Philadelphia [was] the best week of my life, honestly. Seeing how much this city loves their own and the community outreach like going back to my [old] school was an amazing memory. ... Being able to enter people’s lives, it’s almost unreal. You’re currently touring with the team, with your latest stop in Boston. What’s the best part about touring? Seeing new places, being able to travel to a different countries … meeting new people and trying new foods. I’ve only been to one country so far with the Globetrotters and that’s Canada, but this summer I’m doing a European tour. ... I’m very adventurous so it should be a lot of fun. Definitely missing my family, not being home and missing some birthdays or holidays. That’s the hardest part, but it’s all worth it in the end. For more information on the Harlem Globetrotters, visit HarlemGlobetrotters.com.